This long overdue consideration of Rhodes’s work brings together the many strands of her practice in an exhibition installation sympathetic to the vivid and often challenging nature of her films, more often seen in a cinema context rather than in the gallery. However, as screening opportunities for experimental film become increasingly rare in the auditorium, the ICA opens up the uncompromising politics of Rhodes’s work to new audiences: whether it is considering sound/image equivalence, street protest or bringing into question the authority of language as a conveyor of information or political truths. Speaking from the darkness of the exhibition space, her films give voice to meanings that are lost or suppressed, finding them in the diverse shapes that language takes: as graphic imprint, women’s voice, musical refrain and even the film projector’s mechanical intonations. This fusion of experimental form with political conviction, evident throughout Rhodes’s body of films, reaches a telling point of convergence in an installation specially configured for the ICA exhibition, which brings together across two screens A Cold Draft (1988) and, on the second screen, In the Kettle (2010) and Whitehall. Each screen thus shows works conceived twenty-four years apart, and yet the films remain remarkably close in the situations of political injustice which they portray. The questions that Rhodes first posed in A Cold Draft, concerning the rights of women and the broader civic rights of the individual in the increasingly privatised environments of Thatcher’s Britain during the 1980s, are only too timely when positioned beside the more recent In the Kettle and Whitehall, with their depictions of the continuing geography of protest and disturbance in London, and the disregard for civil liberties from government and police alike. A dynamic collage of image and sound plays across the two screens suspended side by side in the ICA’s upper gallery, returning us to Rhodes’s comment about the play of meanings that occur between voice and sound. Here the viewer is prompted to discern meaning across the palimpsest of acoustic and visual traces, which reverberate between the screens. As Rhodes’s spoken words echo across from A Cold Draft to lend prescient narration to the photographic fragments of newspaper coverage, police reports, legal documents and abstracted footage of street protests depicted in In the Kettle and Whitehall, we find a stark reaffirmation that nothing has changed. Examples of Rhodes’s exploration of the televisual medium are also presented on a monitor opposite the entrance to the exhibition, punctuating the darkened immersion of the two adjacent projection rooms. Goose and Green and No. 8 Bus are representative of Hang on a Minute, a series of thirteen one-minute films she made with Joanna Davis in 1983. Commissioned by Channel 4 to appear in between other programmes, Hang On a Minute addressed issues topical to the political landscape of the period – many of which are still urgent today, from Greenham Common to domestic violence – with formal ingenuity, wit and contained but steel-edged anger at injustice. Here language unrolls across the (television) screen in the form of statistics, newsprint, legal document, poetry, prose and hand-written words; it is spoken, sung and recited. Rhodes’s radical fusion of political conviction with formal experimentation echoes both the passionate dialectics of Dziga Vertov and Sergei Eisenstein, and the engagement with political questions through material means characteristic of the work to emerge from the London Film-Makers’ Co-op during the 1970s, part of an investigation of what Malcolm Le Grice has since referred to as a ‘politics of perception’.3 Rhodes was an involved member of the Co-op during this period and, like many film-makers there, the accessibility of its printing and processing equipment encouraged her to explore her interest in language and the visual score through a material investigation of both its graphic qualities and its performative potential. The earliest example of this enduring exploration can be found in the patterns of stripes, dots and lozenges that play across the screen in the 16mm short film Dresden Dynamo (1971). Its colourful abstraction might be compared to the exuberant animations of Len Lye or Norman McLaren. But it soon becomes clear that the images and the austere electronic soundtrack that accompanies them are not a musical counterpoint created through the artist’s marriage of abstract form to musical rhythm. According to Nicky Hamlyn, Rhodes discovered that ‘a certain grade of Letratone transfer made the note of middle C when applied to the soundtrack area of 16mm film and projected at 24fps’.4 From this chance discovery Rhodes was able to develop a sound/image equivalence, in which, like the grooves and scratches of a vinyl record, her stencilled shapes are transformed into a curious sonic play as the projector’s internal sound head traces over and amplifies them. Dresden Dynamo’s bright shapes are thus not merely decorative but operate as a visual score in motion, whose deep notes and swooping pitch are the mechanical song of the projector itself. From these abstract beginnings Rhodes has developed a distinctive film practice which fuses formal experiment with political intent, asking questions of the ideological underpinnings to be found not only in the language of cinema, but more widely, in culture, society and politics. She made Dresden Dynamo whilst still a student on the media communications course at the North East London Polytechnic, and its enlightened engagement with the debates and practices of media – from graphics and concrete poetry to film – can still be traced in the way processes of drawing, the graphic quality of words and the still photograph inform her work. Furthermore, whilst Dresden Dynamo may have been Rhodes’s first film its material exploration of sound and image synchronicity echoes throughout her work, even if later films do not share its strict formalism. In other early works such as Amenuensis (1973), for example, the lost office correspondence of an ink-infused typewriter ribbon becomes archaeology, as its previous communications are now thrown into relief by the film printing process, transforming urgent office correspondence into an entanglement of indecipherable hieroglyphics. Rhodes also extended her examination of sound/image equivalence into the space of the spectator through the development of a number of expanded film works. Light Music (1975), shortly to be installed as part of the launch of the Oil Tanks exhibition space at Tate Modern, is the most well-known example. In this double-screen film two projection beams are given sculptural visibility by a smoke machine, converging and traversing each other across a room to create a beguiling and visceral space of sonic disorientation. Bwlhaictke, the film performance she made with Ian Kerr, represents an earlier involvement with the ICA as part of the Expanded Cinema festival held there in 1976. 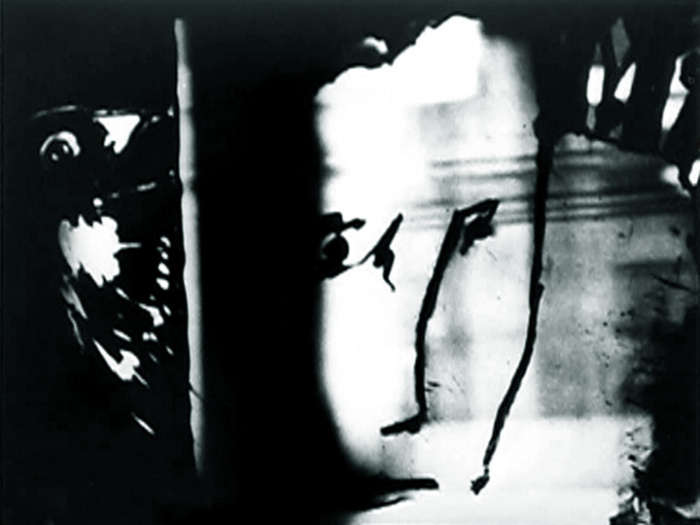 Over the duration of many hours, the artists scratched a loop of black leader until it was clear, and filled in an adjacent loop of clear celluloid with chinagraph pencil, in a process of filmic reading and writing which simultaneously unfolded and disintegrated before the viewer as meaning broke down into visual and audio noise. Rather than a departure, Light Reading might thus be seen as a synthesis of the different evocations of language that Rhodes explored in earlier works, spoken, written and drawn together into a multi-layered composition that now finds parallels with the voices reverberating through the rooms of the ICA’s current installation. The film intermittently resolves itself into a loose narrative shape, which is in turn negated by the silent rush of unintelligible numbers and letters on screen, interspersed with the abstraction of indecipherable still images and prefaced by the artist’s own voice-over; in which the repetition of phrases and questions not only defamiliarises but also actively challenges meaning. It is significant that her dexterous twists and turns of language, echoing Stein’s linguistic blurring of identities, turn specifically on the feminine possessive pronoun; as the writer Felicity Sparrow notes, ‘“She” is spoken of as multiple subject – third person singular and plural’.7 Rhodes’s repeated use of language, the ‘her’ and the ‘she’ of a female subject, like her fractured narrative, never assumes the shape of a particular woman, but remains an identity out of reach, the question of female posed by patriarchal language; the female hidden in the narratives of history, of cinema, literature and music. Light Reading’s exploration of female subjectivity reflects Rhodes’s increasingly overt engagement with the concerns and campaigns of feminism during the 1970s. Along with Sparrow and other women artists such as Annabel Nicolson, Susan Stein and Mary Pat Leece, she signed a collective statement withdrawing from the 1979 ‘Film as Film’ exhibition at the Hayward in protest at its lack of female representation, querying how language can become a force of omission in her commanding essay ‘Whose History?’ for the exhibition catalogue.8 The women’s withdrawal from the exhibition provided some of the impetus for them to found Circles, a film distribution organisation committed to the support and promotion of films by women artists, ‘whether the subject matter be personal or political, figurative or formal and create our own “definitions” and “contexts” as women artists’.9 With this objective in mind, a discursive and consensual structure of screenings and practical workshops were developed to encourage women of all backgrounds and interests to engage with film. The concerns of female emancipation, both personally and in the wider political sphere, are integral to her films Pictures on Pink Paper (1982) and A Cold Draft, made when Rhodes was playing an instrumental role at Circles, acting as Arts Advisor for the Greater London Council, a local public funding body, and continuing to be involved in the campaigning politics of women’s liberation. Both films use voice, against fragmented collages of still and moving images of landscape, streets, interiors, as well as words and drawings, to speak of the conflicts and uncertainties of a universal female experience. The exhibition at the ICA acts as a potent convergence for the passionate questions of representation and politics which animate Rhodes’s work, and the formal means by which she addresses them. The different periods of film-making which are set into play between the two screens of A Cold Draft and Whitehall not only reminds the viewer of the continuing injustices which determine our political systems but also underlines Rhodes’s long-standing commitment to listening carefully and looking closely at the language of patriarchy, of media reportage, of politics and the law. As the viewer moves between screens and across the darkened screening rooms at the ICA, he or she is also positioned at the uneasy, yet compelling, space between image and sound opened up by Rhodes. In the stark messages which this exhibition seeks to convey concerning the current political realities which reverberate outside the door of the ICA, with its views up to the dominant seats of governing power, both elected and unelected, Rhodes continues to make the (still debated) argument that experimental modes of film-making have the same direct power of political advocacy as more conventional documentary film-making. Indeed, in the urgent rhythms of her collaged imagery, oscillating between stillness and movement, emerging out of photographic document, and merging into abstraction and a flow of letters, numbers, statistics, could it not be said that a more fitting film form has been found for the desperate and pervasive politics of our age?